I have something really special I want to talk about, but it has nothing to do with games, at least not at first glance. It's called Building Stories, and it's a graphic novel of sorts. By the looks of it, Building Stories seems more like a board game, a meaningful analogy all things considered. Open the box and you will find fourteen stories, or parts of a story. These include a gold-trimmed hard-cover reminiscent of children's books, a huge over-sized newspaper-like comic, a large board-game-like story, stretched pamphlets, short-stories, and more. For those with any interest in reader-driven storytelling (ie., anyone who plays games), this is a work you must experience for yourself. 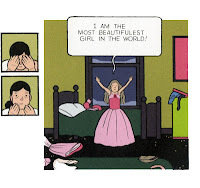 Written and drawn by the brilliant Chris Ware, Building Stories explores themes of loneliness, depression, regret, and expectations with vivid coloring and gorgeous illustrations that often appear architectural in nature. Many of the pieces read like infographics, plotting the life moments of a failed art-students and those around her though the author, and the characters themselves, were trying to make sense of life unfulfilled. Interactivity, participatory storytelling, is at the heart of Building Stories. Reading the graphic novel is a form of collaboration, as it asks players you to plot your own path on the journey. The contents can be read in any order, and therefor events take place at different points in time. Regardless, all of the events begin to make some sense in relation to each other. You may meet the upstairs landlady of the protagonist before you meet her daughter, depending on where you begin. Alternatively, you may enter the story through a Branford the Bee, a tragic insect that buzzes through the story here and there, following his own arc through the narrative. The set of stories also includes a couple double-sided pamphlets that can be read one way or the other, looping back around to tell a different but thematically consistent story of troubled life. Do not mistake Build Stories for an "artsy" jumble of haphazardly put-together comic strips. Like a well designed game, this is a carefully constructed experience, it just demands your participation. When everything is read, things make sense, or rather, you make sense of things as best you can. The work captures the almost terrifying process of understanding your life in relation to singular places in time, past moments that collectively make up your life. The pieces are inseparable from the whole. In a digital age, making your way through user-driven and tactile experience is immensely rewarding. Reading Building Stories actually reminds me of playing Dear Esther, a game whose narrative must also be scrapped together by players combining narrative voice-over and environmental clues. Both experiences, if you let them, are also deeply moving. If I haven't sold you on the "book" yet, maybe the many accolades Ware has earned can sway you. 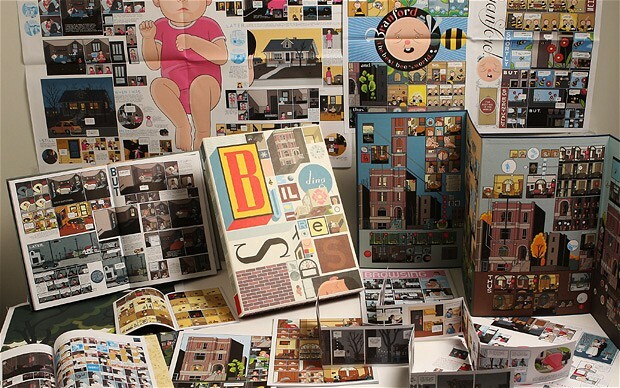 Building Stories is the winner of the Cartoonist Studio Prize for Best Graphic Novel, Publishers Weekly's Best Book of the Year, Entertainment Weekly's Best Fiction of 2012, Boing Boing's Best Graphic Novel of the Year, among others, and appeared in several Top 10 Books of 2012 lists. Those gamers interested in interactive and spatial storytelling will find comfort in exploring the powerful (and deeply depressing) work. One last piece of neat information regarding Building Story that you may find intriguing, the back of the box offers several "appropriate places to set down, forget or completely lose any number of its contents within th walls of an average well-appointed home." I love Chris Ware! Have you ever seen the animation he did for This American Life? I bought a copy of Building Stories as a gift for a friend, but I might actually end up keeping it for myself. No one would blame you for keeping it. Also, I haven't see that video, so thanks for the share! helps people with anxiety and other mental health disorders..